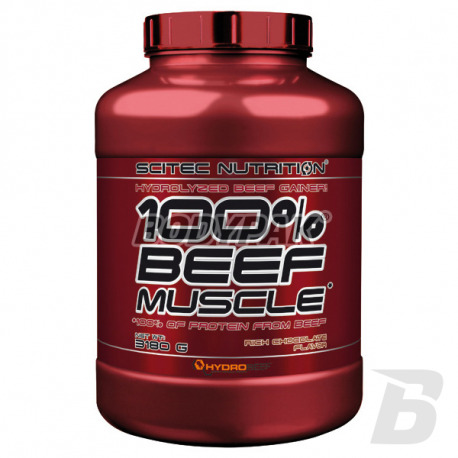 Scitec Nutrition 100% Beef Muscle is the only of its kind gainer based on hydrolyzed protein peptides beef.go. 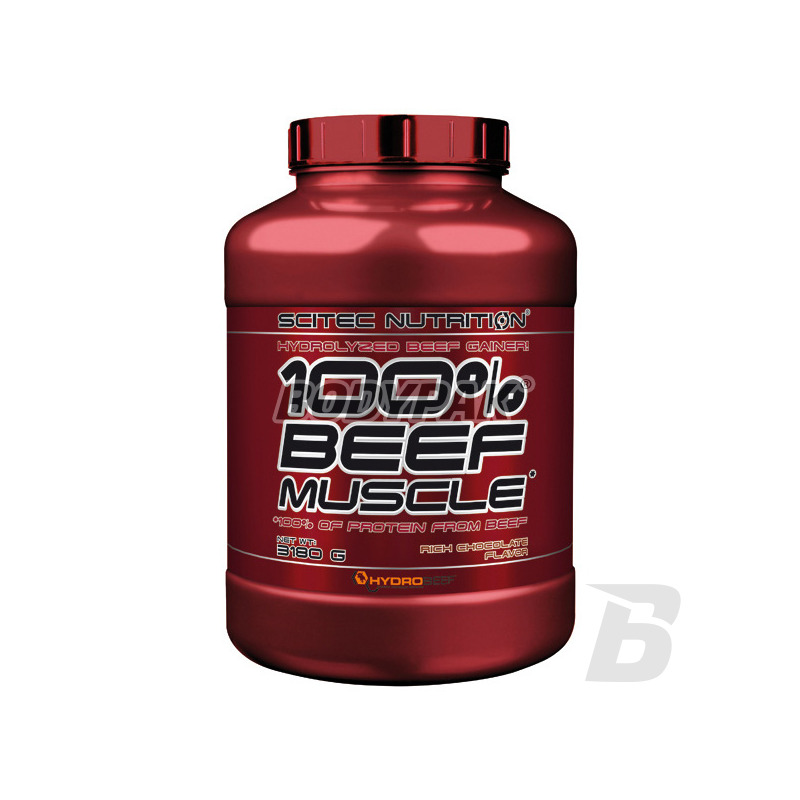 100% COMES WITH PROTEIN HYDROLYZED PROTEIN ISOLATE BEEF! MIX DIFFERENT TYPES OF CARBOHYDRATES! WITHOUT MILK DERIVATIVES, WITH NO ADDED CREATINE! Beef is legendary importance of hard training, focused on the athletes -many people experience greater benefits from eating beef than poultry. Therefore, why not try sheiks protein from beef if this high-quality raw material powder is possible to order? Scitec HYDROLYZED BEEF ISOLATE Peptides is a complete hydrolysed beef peptide produced from fresh raw beef - 100% natural product free of hormones. It is enzymatically hydrolyzed protein in bovine, which is much faster absorption of the protein. The complete protein source provides the body with all the essential amino acids in the 9 amino acids which are not synthesized by the human body and must be supplied after the food (eg. Histidine, isoleucine, leucine, lysine, methionine, phenylalanine, threonine, tryptophan, valine). We have also added 2 grams of leucine in free form, which is one of the most important amino acids! Dietary protein is a source of nitrogen and essential amino acid which the body needs for growth and maintenance of tissues. Therefore, 100% BEEF MUSCLE has a protein content contributes to the development and maintenance of muscle mass and bone health. 100% BEEF MUSCLE also provides several types of carbohydrates - including the popular waxy maize starch - to make fuel for heavy and exhausting workouts and metabolic processes. Many products based on bovine proteins are not good! In turn our protein beef tastes delicious, it is worth a try yourself! * The salt content is due only to the natural presence of sodium. Ingredients: Maltodextrin, Hydrolyzed Beef Protein Peptides, Beef Protein Isolate, Corn Starch, Flavor (Cream, Cream Vanilla), Yoghurt Powder (Made From Milk), L-Leucine, Emulsifier (Soybean Lecithin Powder), Thickenener Xanthan), sweeteners (sucralose, Acesulfame K). Wzrost masy zauważony. Ciężkie treningi + dieta jak najbardziej Scitec mnie zadowolił. Mięśnie twardsze i wieksze.Od razu spożywam po treningu, smak czekoladowy 5/5, z rozpuszczalnoscia może być, konsystencja po wymieszaniu jak budyń. Stosuje zawsze po treningu, widze przyrosty i czekam na dalsze efekty!